COLLEGE STATION, Texas — Thursday evening was about coming together to raise money for phase two of the Fun for All Playground. But for donors present, the night meant much more than a good time. "It's really not just about raising money... it's about raising awareness for kids with disabilities.// we're thrilled that this many people have come out to support the park," said donor, Mark Roenigk. 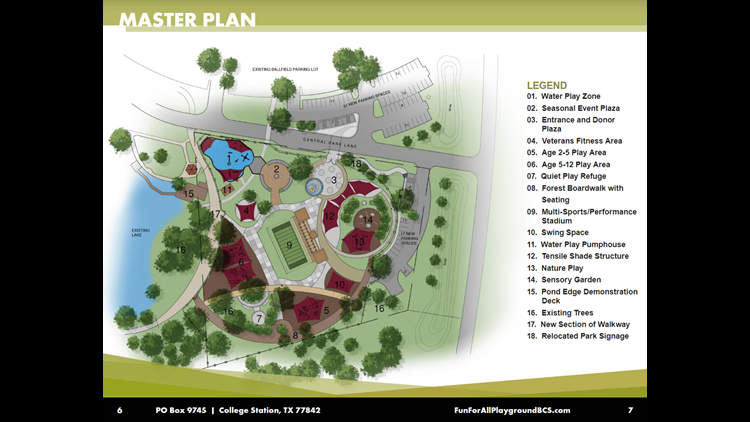 The Fun for All Playground will be at Central Park in College Station and will provide a safe atmosphere for those with special needs-- with equipment like chair swings and sensory items. Phase two of the park includes the entrance and donor plaza, the Carolyn and John David Crow field and sensory arenas. If you want more information on park developments or would like to make a donation, click here.